The political connections of Bernard Moore, guest lecturer in political science, are extensive. 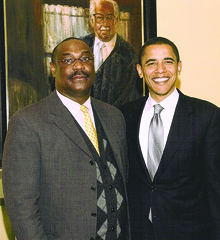 Bernard Moore, visiting lecturer in the political science department, has an intense rivalry with Senator Barack Obama. But their competition doesn’t play out on Capitol Hill. Instead, it’s a spirited battle on the basketball court. Moore’s connection to the political elites in Washington D.C. does not end there. Along with the current Democratic presidential candidate, Senator John Kerry and Speaker of the House Nancy Pelosi are also Moore’s close friends and contacts. To say that Moore is well connected in the political community is definitely an understatement. Moore was able to broaden this rolodex of political relationships after serving as a Congressional Fellow for the Congressional Black Caucus Foundation, where he met numerous representatives in the House and the Senate. “Congressman Danny Davis, Congresswoman Diane Watson and Senator Barack Obama were all mentors that I met through the Congressional Black Caucus Foundation,” he said. Since meeting Obama, his relationship with him has only flourished. In addition to being a good friend and basketball buddy, “Senator Obama has been extremely influential for me,” Moore said. “In terms of public policy, he was an advisor and he was also involved in events that I organized on Capitol Hill.” And Moore certainly anticipates having the ear of the administration if the Democratic presidential candidate wins the presidential race. He even has connections to Senator Joe Biden, Democratic vice presidential nominee, who sponsored in the Senate a bill Moore authored. Moore pursued his passion for politics and got his start in community government while growing up in West Los Angeles. He didn’t become involved on the national level until much later in 2004. Despite getting a relatively late start in politics, within four years of serving as a Congressional Fellow for Congressman Danny Davis, Moore formed his own think tank, Second Chance for Social Justice. “I started [the think tank] with various members of Congress as an advisory board with people who I had met through the Congressional Black Caucus. I was definitely motivated by issues regarding social justice,” he said. In addition to his vast network of political colleagues, Moore is also considered an important player in the Washington scene. This past year, Moore wrote The Second Chance Act of 2007, which was passed by both the House and Senate and recently signed into law by President Bush. The bill was a result of Second Chance for Social Justice, whose main goal is to reevaluate the current federal prison system, specifically prison reentry, disenfranchisement, sentencing policies and overall criminal justice. The list of causes that Moore has played a major role in seems to be endless. For years he has been raising awareness regarding the racial disparity in the U.S. by working on the National Minority Aid Council. Moore has also just finished an amendment to the federal prison code, advocating good behavior and work credits toward a sentence reduction. He has even put together an instrumental symposium for the reauthorization of the Voting Rights Act. However, the beauty of the Purple Valley has not stopped Moore from commuting between Washington D.C. and Williamstown since the start of the school year. As a result of Moore’s Capitol Hill connections, more and more critical players in U.S. politics are slowly trickling into the seclusion of Williamstown. Last Monday, Moore invited three federal judges to a roundtable discussing “Racial Disparities in the Criminal Justice System,” and even plans to bring Kerry as a guest speaker for one of his classes in November. Because of his positive impressions of student interest in politics on campus, Moore is trying to reach out to the students and help place them in valuable internships by taking advantage of his rolodex. “I think internships and jobs on Capitol Hill are the best way for students to get more involved in politics,” Moore said. The isolation that comes with living in rural Western Massachusetts often seems to cut students off from the outside world. However, with his impressive political background and connections, Moore is slowly expanding the Purple Bubble and bringing a greater sense of political awareness to campus. really? a shot at the record because they wrote a puff piece? smh. Yes! They wrote this two months into the semester. The vast majority of Moore’s students had already, by that time, decided that he was one of the worse professors they had ever had at Williams. Did the Record report that important fact? No. By the way, I wonder if Moore was really such buddies with Obama . . .
Feel free. The photo is not coming up in my (admittedly antiquated) browser. Did you really expect the kids at the Record investigate whether students hated Moore when they were doing a run-of-the-mill interview piece? Please. Andy: Is it to much to expect them to interview a single student in Moore’s class? @Andy: The argument is that the paper is soft, not necessarily that it’s bad. If they want to shed that soft label, then most certainly I’d expect an interview. There is nothing more than a Google Search and a 5 minute interview with the man in this article — hardly a piece of strong journalism. If I’m the author of this piece and I’m applying for a job or a post-grad program, I’m certainly not submitting this as my writing sample. Kane thinks the world of himself. We’re just not that into you. The shocker is that this con-man could sit there and name-drop long enough to fill an entire Record article with nothing but self-serving garbage and nobody seems to have seen the red flags. EphBlog is powered by WordPress and delivered to you in 0.855 seconds using 39 queries..